D & D ANTIQUES GALLERY HAS BEEN IN BUSINESS FOR FIVE GENERATION & HAS ONE OF THE BIGGEST COLLECTIONS OF FINE & UNIQUE ANTIQUE LIGHTING IN THE WORLD FOR SALE. THE COLLECTION CONSISTS OF THOUSANDS OF PIECES OF RARE LIGHTING SUCH AS CHANDELIERS, SCONCES, LAMPS & MUCH MORE. D & D ANTIQUES HAS BEEN SELLING TO TOP CELEBRITIES, TOP DECORATORS AND COLLECTORS FOR MANY YEARS. 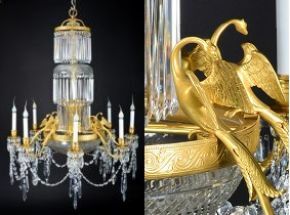 THE IMAGE IS A SPECTACULAR ANTIQUE PERIOD RUSSIAN GILT BRONZE & CUT CRYSTAL WATERFALL CHANDELIER,CA.1820.